"Ancient cup-and-ring stones "are ostensibly non-linear carved designs on outcrops of rock or solitary boulders. 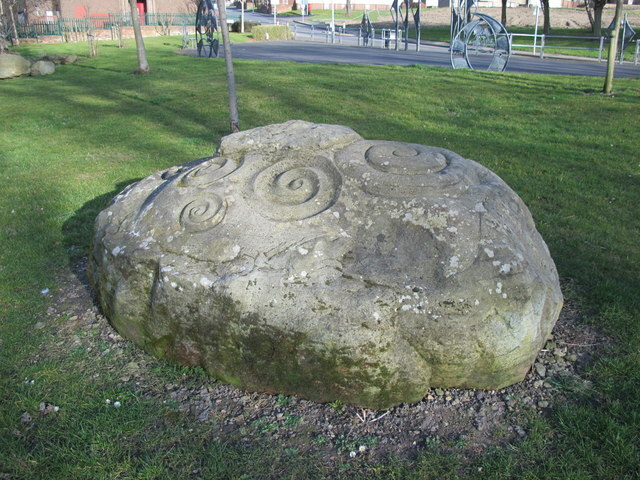 British examples originate from the neolithic period (some may be even older). Their central features are small rounded cup-markings, circles, semi-circles, curved lines, straight-ish lines, and double- & multiple-rings, all in usually abstract design-forms". For further info, see The Northern Antiquarian website https://megalithix.wordpress.com/sites/cup-ring-stones/ . The Keys to the Past website lists over 300 examples of cup and ring rocks in County Durham and Northumberland http://www.keystothepast.info/Pages/pgResult.aspx?SEARCH=cup+and+ring . Many of these have been photographed by Andrew Curtis http://www.geograph.org.uk/search.php?i=54803597 ." Photo by Mike Quinn, 2015.